It is with a very heavy heart that I have to inform the British Cardiovascular community of the untimely death of our colleague and friend, Dr Jagdip Sidhu. Jagdip was a hardworking, considerate and humble clinician who always looked out for his colleagues, staff and his juniors. 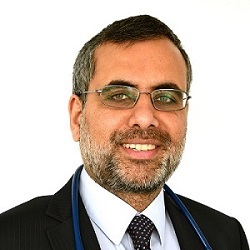 He was appointed as consultant cardiologist to Dartford & Gravesham NHS Trust (DGT) and Guy’s & St Thomas’ NHS Foundation Trust in 2007 and was instrumental in DGT gaining recognition as a coronary interventional centre less than 2 years later. As the lead clinician for cardiac services over the last 6 years, he worked tirelessly in pursuit of the development of the cardiology department – establishing and supporting the local community heart failure MDT meetings, succeeding in expanding the consultant team from 4 to 6, raising the profile of Darent Valley Hospital to become part of the cardiology specialist training rotation for Kent, Surrey & Sussex, and co-developing services and MDTs with our tertiary centre partners – Guy’s & St Thomas’ and King’s College Hospital through the integration of digital technologies as part of the recent Vanguard programme. He did all of this while at the same time being a skilled coronary interventionalist and a dedicated cardiologist to his many patients. He was always more than generous in giving his support and sharing his expertise with his close and broader clinical colleagues in every speciality including our local GPs in the management of their patients. He has left an enormous hole in our department, the trust and in our hearts and we can barely imagine the loss to his friends and his beautiful family. I’m sure you will all join me in extending the condolences of the entire membership of BCS to his wife Sacha, his children and family.